To put it in simple words, a rollator is basically a walker that has wheels at the bottom of each leg. Currently, we can find rollators with 3 wheels or 4 wheels and most of them have a basket that can be used to carry items. In general, rollator walkers offer not just the utility to carry items but also support for the ones that have difficulties walking on their own. 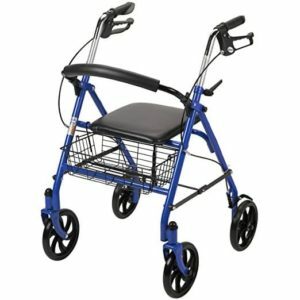 Unlike regular walkers, rollators only need to be pushed around. They do not need to be lifted in order to allow the user to move around. Also, the wheels make it quite easy to use outdoors even on surfaces that are uneven. In order to be used indoors, rollator walkers were designed to be narrow enough so that they can fit through doors. Usually, rollator walkers are used by people that have difficulties walking on their own and while they are a bit more expensive than regular walkers, they are much more popular because of the mobility they offer. People that are out and about a lot know how inconvenient traditional walkers are. 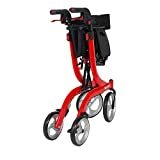 Fortunately, there is a wide selection of rollator walkers available on the market and we decided to inspect them and pick only the ones that offer the best benefits, are well built and do not cost a small fortune. With all these things said let’s jump right into our list of recommendations for the top 10 best rollator walkers in 2019. 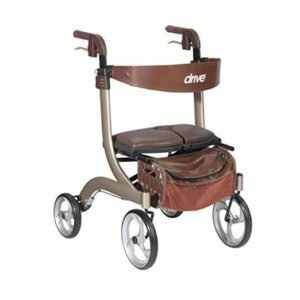 Drive Medical Nitro DLX rollator walker is a euro-style model that uses large caster wheels to improve the comfort of the person using it. The model has a foldable design that makes it easy to store and a lightweight frame. The handles have special handles that serve as breaks to stop the wheels. In terms of storage, the rollator comes with a removable zippered leather bag. The height of the model can be adjusted without any tools and folding it is very simple and straightforward. The seat of the rollator is a bit uncomfortable in the sense that the filling is very soft and pleasant but there is a really hard insert at the bottom. The proper way to do it is to use more stuffing for the seat that provides better cushioning for the user. 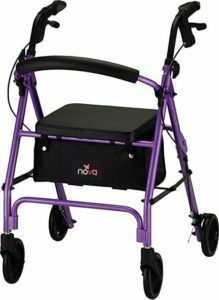 The NOVA Vibe 6 is a great little walking rollator that is not too expensive and quite lightweight which makes it easy to move around. It uses 6-inch wheels and a padded seat placed on top of a small pouch. Folding the rollator is quite easy and simple while the total weight is just 16 pounds. 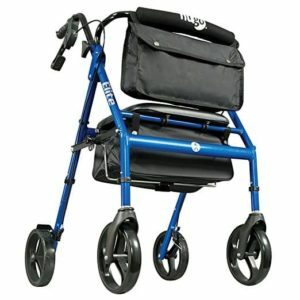 The frame of the rollator is made out of aluminum and can be found in 8 different paint finish colors. As for the breaks, they offer optimal control and come with a 5-year warranty. Last but not least, the handle height can be adjusted and the maximum supported weight is 300 lbs. The breaks of the rollator do not come properly adjusted. Sadly, there is no tool shipped with the rollator to properly tube the breaks. It will need a hex screwdriver and fortunately, they are fairly common. If needed, they will have to be purchased separately but they are not that expensive. Healthcare Direct 100RA is a reliable pick for the ones that have a limited budget. The model is fairly simple with caster wheels and breaks on each handle. According to the product specifications, the rollator has a maximum load limit of 350 pounds. It is also foldable which means that it is very easy to transport when not in use. As for weight, the rollator uses an aluminum frame to keep it light but sturdy at the same time. The seat of the rollator offers good support and right beneath it, there is a small zippered storage pouch. Even if the handles can have their height adjusted, they do not go high enough for a tall person. Someone tall will just find it difficult to use. Sadly there is no workaround or means to just raise them higher. 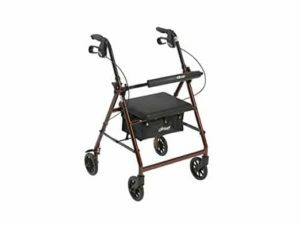 Medline heavy duty rollator offers a good balance between build quality and a reasonable price tag. 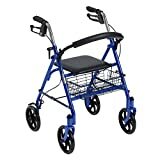 The model is made using durable caster wheels and adjustable handles. The handles can be raised while the seat is very comfortable as it has a soft foam padding and a durable leather cover. Baath the chair, a small storage pouch has been fitted. Unlike other rollators, this particular model uses 8-inch wheels which makes it easier to handle even over uneven terrain. Even if the stated maximum capacity is 500 lbs. the wheels of the rollator do not appear to support such a weight. In fact, over 250 lbs. and the wheels will start to give in. They can be replaced but the replacements are a bit difficult to find. 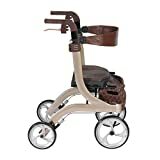 HealthSmart Euro style rollator walker is one of the more expensive models on our list. However, it does compensate with a very sturdy build quality and good mobility. The model is made of large caster wheel made with rubber that improves grip and stability. The model also uses a lightweight aluminum frame and can have the height of the handles adjusted. In terms of capacity, the model can sustain a maximum weight of 300 lbs. It has a small storage pouch and has a foldable design. The seat does not have any kind of padding or cushioning. In fact, it is made out of a textile material, suspended between two aluminum frames. This makes the seat not as comfortable as a regular, foam padded one. This design makes it easier to fold. 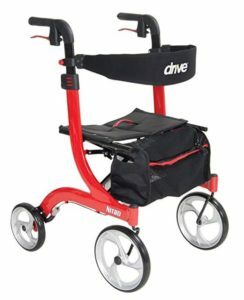 Drive Medical Nitro euro style rollator walker is a bit different from other models in the sense that has larger wheels. This makes it easier to work with over uneven terrain. The rollator uses a compact design as it is foldable and has a simple seat made out of a textile material. 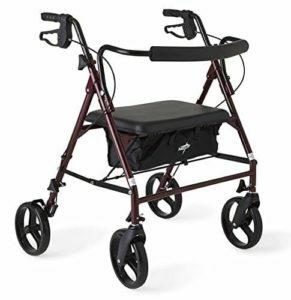 The breaks of the rollator are very reliable while the frame is sturdy enough to support a load of 300 lbs. 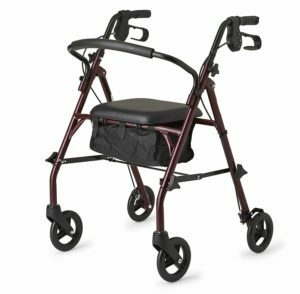 Last but not least, the rollator comes with a small zippered storage bag and a handle on the seat that makes it easy to carry around. If there is one issue that the vast majority of people buying this model will have is with the storage bag. The storage bag is unreasonably small. In fact, it might just be the smallest storage bag of all the rollators that made it to our list. 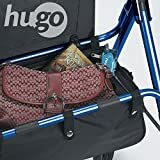 Hugo portable rollator walker is exactly what the name states. It is a simple rollator that was designed to be as portable as possible. This means using a lightweight frame and a foldable design. The rear wheels and their supporting frame can be pushed in which makes it uses less space. The seat of the rollator has a soft foam padding and a leather cover that makes it quite comfortable. 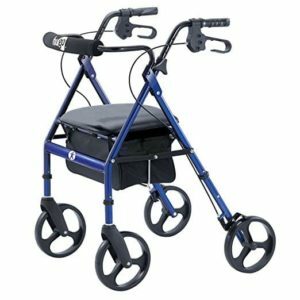 Like any other rollator, it has rear wheel breaks and height adjustable handlebars. The rollator does not come completely assembled. It needs to be put together by the user but fortunately it no additional tools is required. The problem comes from the installation of the wheels. They are very difficult to snap into place and will require being forced in. They almost feel like they will snap when pushed in. 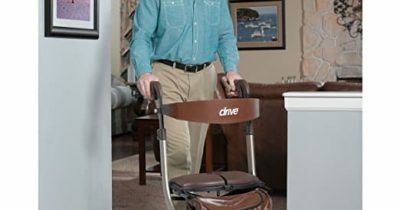 Drive Medical aluminum rollator is a good pick for the ones that are looking for a budget solution. For such an inexpensive rollator, it is quite well built. The breaks are very reliable and the seat is comfortable enough. According to the product description, it can support a maximum weight capacity of 300 lbs. and uses durable 7.5-inch wheels. The model also has a small textile pouch that can be used to store items. The handles have a soft rubber padding that offers better grip while the tires have a soft outer layer that improves comfort. The rubber tires do a very good job of absorbing mild shocks. The issue with them is that they tend to come off after some time. A possible solution is to just glue them back to prevent them from slipping off the wheel again. Hugo Elite rollator walker is one of the best-selling products that earned a spot on our list. The model is fairly simple and straightforward but it has a much sturdier frame and very durable caster wheels. As expected, it has adjustable handle bars and a padded seat. A useful feature is the addition of a second storage pouch. The breaks of the model are very reliable and the wheels do a fairly good job at absorbing small shocks. Setting it up is fairly simple and requires no tools while the folding design ensures it takes very little storage space. The fact that the rollator is a bit heavy is not much of an issue itself. It becomes a problem when the weight stated by the manufacturers is actually different from what it is in reality. 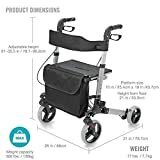 The rollator is stated to weigh 11 lbs. but it actually weighs 16 lbs. 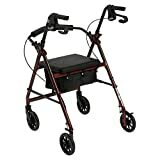 Drive Medical rollator walker is by far the most popular choice when it comes to talking aids. It is inexpensive and provides reliable support and comfort. The padded seat is very sturdy while the breaks offer good control and security. Unlike other rollator walkers, this model has a basket instead of a small pouch. It also has a foldable design to make it take very little storage space and large caster wheels. Assembly is quite simple and the maximum allowed capacity is 300 lbs. Compared to other rollator walkers, this model has a rather small seat. It might be a bit uncomfortable to sit on especially with larger individuals. The ones that have no problem with the size of the seat will find that it is extremely comfortable. There are a lot of rollator walkers to choose from. Sadly, with all the models available, diversity seems to be quite scarce. 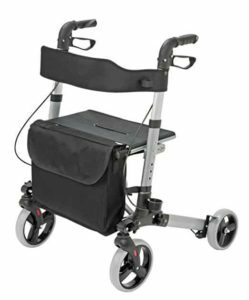 There are not that many different models and in most cases, we see the exact same rollator but with a different branding. They usually have the same features and same design but there are a few differences between them or at least for the models that were selected for our list. Here are some important aspects worth checking out when picking a rollator walker. Price tag: The price tag is one of the first things to look at when comparing various rollator walkers. It is highly likely to compare extremely similar models but one model might be 3 times more expensive than the other one. The reasonable choice, in this case, is fairly obvious. Maximum supported capacity: Depending on how the frame is made and the robustness of the wheels, rollators may support different load capacities. Most of them support around 300 lbs. while others can withstand even 450 lbs. Storage capacity: A rollator walker without storage is not that useful. Fortunately, almost all of them have some kind of bag or basket that can be used to store items. The storage capacity can vary a bit and some models even have a secondary storage pouch.